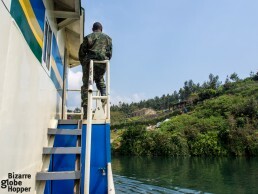 We had heard dreadful stories about Lake Kivu, a killer lake that could explode any time killing millions. 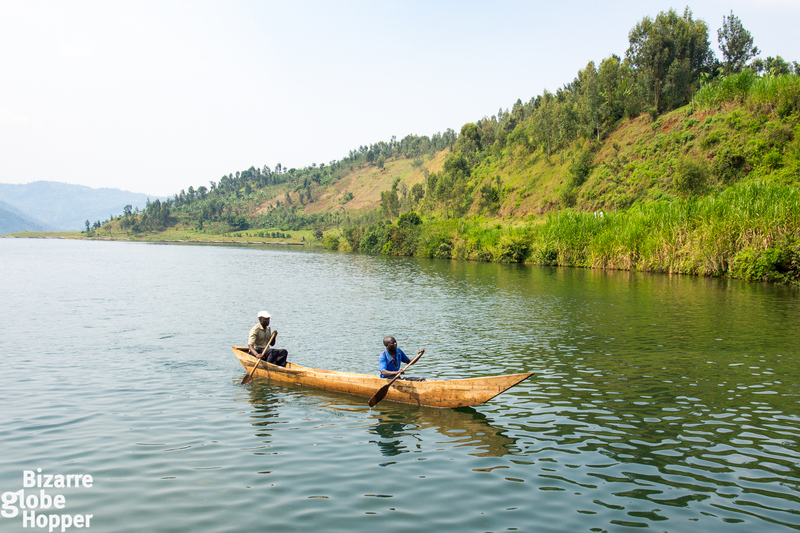 After arriving at the shore of these deadly waters between Rwanda and the Democratic Republic of Congo, we were seized by the placid beauty. 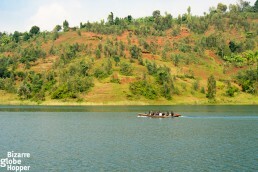 Still hesitantly, we decided to overcome our fears and sail through the Lake Kivu, all the way from Kibuye to Kamembe. 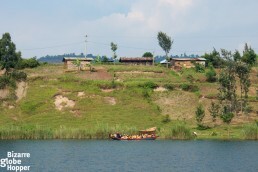 Time stands still on the banks of Lake Kivu. 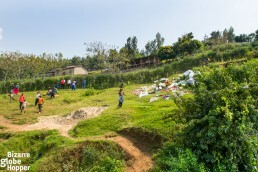 Women carry varying loads on their head, heading to the lakefront to sell their crop or do laundry while kids are bathing in the deep blue waters. Fishermen row out to catch their draft in bright, wooden boats that return in the dusk. Above this idyllic scene hangs an ominous shadow that can be seen on a bright day in the shape of a cone. 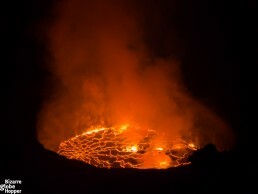 Nearby Nyiragongo and a chain of other volcanoes saturate the waters of Lake Kivu with carbon dioxide. 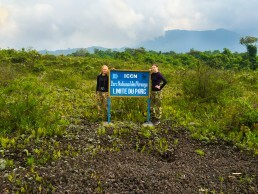 When Nyiragongo erupted in 2002, it cast lava to the lake, both from above and below, cumulating the issue even further. Usually, the gasses lie rather calmly under the water pressure, finally dissolving and saturating the waters. But in the end, the interaction of the lake water and CO2 result in a record-breaking concentration of methane. When disturbed, the gasses can explode and annihilate life around the lake, causing possibly a lake tsunami, as well. When the gasses at the bottom of Lake Kivu rise to the surface, they create a lethal fog that can suffocate any living thing on its way.  The phenomenon is called a limnic eruption. There are two other killer lakes in the world, both in Cameroon. The limnic eruption, also dubbed a lake overturn, has happened there, killing 1,800 people. 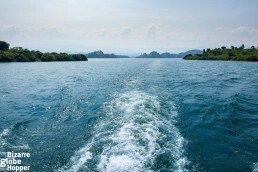 But Lake Kivu is 2,000 larger than the lakes in Cameroon, and it contains a way more deadly gasses. 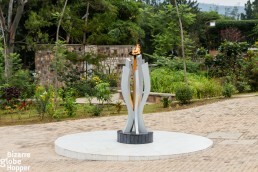 When the limnic eruption happens in Lake Kivu, the catastrophe will be tremendous. 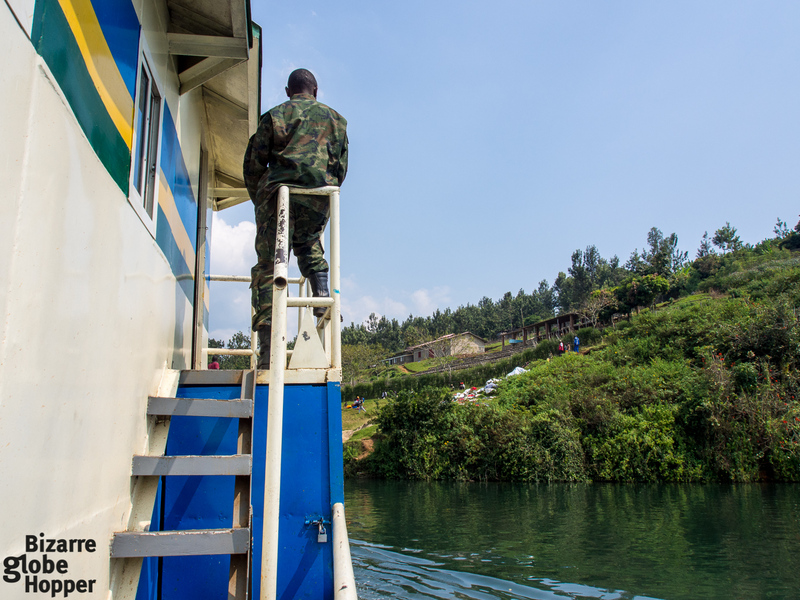 Until now, Lake Kivu has been emitting only occasional deadly farts, committing small-scale murders. But it wasn’t a calming thought to me. We were supposed to drive the meandering road from Kibuye to Kamembe (Cuangugu) and further to Nyungwe Forest in just one day. Already exhausted from the long drive from Kigali to Kibuye on the day before, we acclaimed the lucky chance to substitute the long drive with a public ferry that crosses Lake Kivu only twice a week. The morning was clear, and the blue waters were glimmering invitingly in the scorching African sun. We could see the silhouettes of green islands through the morning haze from our porch. The smell of adventure was hanging in the air. Behind the picturesque scenery lurked the stories of the murderous lake, making me both excited and a bit nervous. 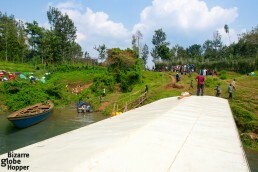 The ferry had already made its way from Gisenyi to Kibuye that morning, and it was full of passengers and cargo. Our guide Vivine showed her talent by negotiating us the prime spots from a tiny cabin upon the ferry, the only one available. The passenger compartment was suffocatingly hot and filled to the brim. 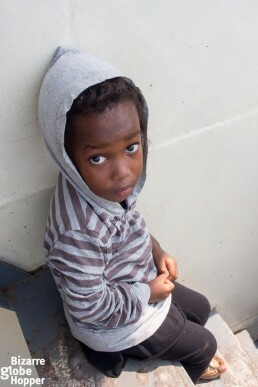 There were no seats on the deck and no place to hide from the scorching sun. 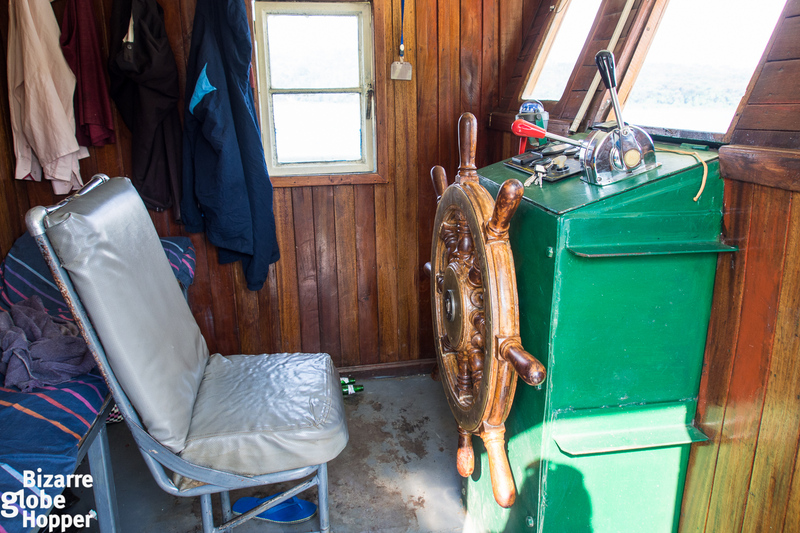 We felt like queens in our small cabin, enjoying the gentle breeze. We were so thankful for the scraggy armchairs that we shared with one Korean guy. Obviously, we were the only tourists on board. The cabin was the perfect viewpoint: through the non-existent door opened the endless lake panorama. The shade of water merged to the horizon, and occasionally, verdant islets rose from the blue, often resulting a quick stop in tiny villages. The locals ran towards the shore to sell and ship their crop or just greet the rare bypassers. We rushed to the deck to capture the scene and wave to kids who were instantly practicing their English with us. I can’t imagine a better way to indulge in the daily life by the shore of Lake Kivu than navigating through the lake with locals. On the cruise, you’ll get profoundly introduced with the local agriculture. 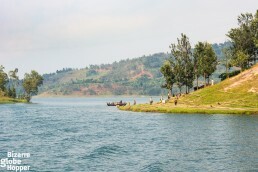 The volcanic land around Lake Kivu is exceptionally fertile, resulting abundant crops of bananas, tomatoes, sweet potatoes, and coffee to name a few. The specialty coffee trade is flourishing on the both sides of the border bringing well-needed income to local smallholders. Some of my favorite coffee beans come from Rwanda, both from Lake Kivu and other areas, such as Huye Mountains. The taste profile of Rwandan coffee usually includes red fruits like cherry and a whiff of vanilla. 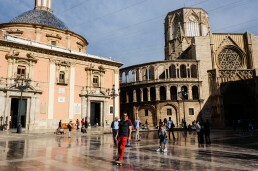 In such a tranquil sceneries, it’s way too easy to forget the fatal powers lingering below. But nearby Kibuye you’ll also pass odd gas extraction platforms, which are turning the deadly methane into a salvating source of energy. The power capacity lying below the surface of Lake Kivu is six times bigger than Rwanda’s current energy production. 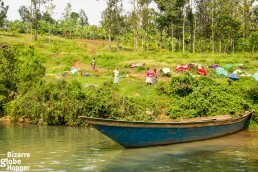 The extraction, if fortunate, could save Lake Kivu from the disaster. 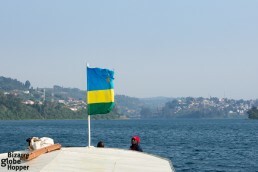 The journey from Kibuye to Kamembe lingers on the border of Rwanda and DRC, hugging the world’s 10th biggest inland island, Congolese Idjwi. The distance from Gisenyi to Kamembe is 230 kilometers. Our trip from Kibuye, lying approximately in the half way, took seven long hours. 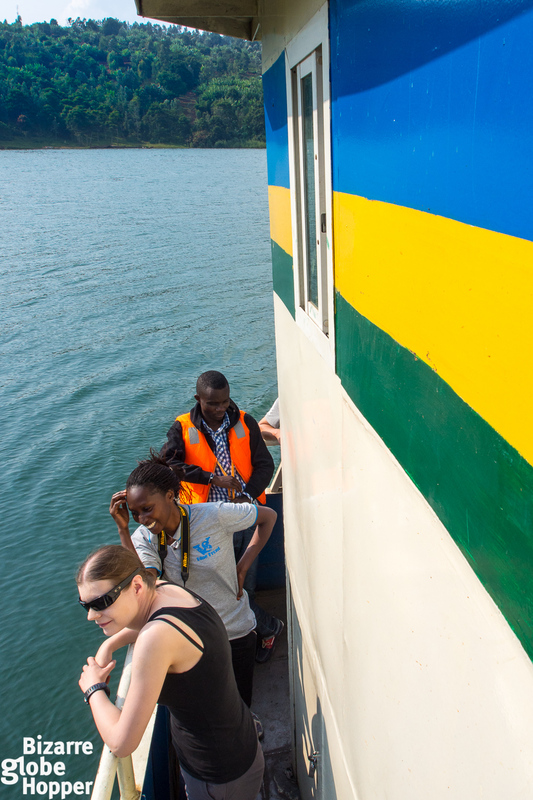 The total travel time from north to south, Gisenyi to Kamembe, is usually 9 to 10 hours. 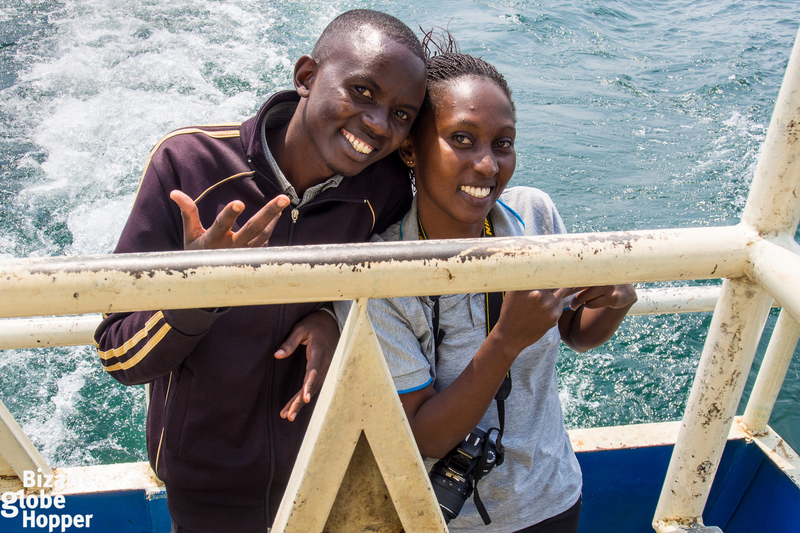 The boat runs from Gisenyi through Kibuye to Kamembe on Sundays and Thursdays, leaving from Gisenyi at 7 AM and Kibuye at 10 AM. Lake Kivu lies in the great Albertine Rift Valley that we’ve also admired in Tanzania and Uganda. It’s one of the African Great Lakes, a series of East African lakes that makes a home for an unbelievable number of endemic species, including 10 % of world’s fish species. More than half of Lake Kivu lies behind the border of DRC, but it’s a way easier to set the sails on the Rwandan side. 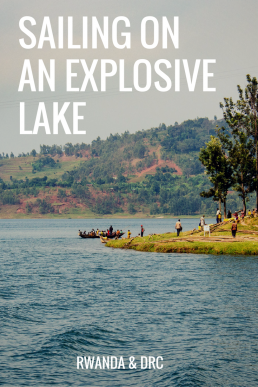 I’d recommend taking the scenic town of Kibuye for your vantage point, as you can first tour the nearby small Lake Kivu islands like we did, and then make the journey all the way from Kibuye to Kamembe (Cuangugu) on these explosive waters. The drive from Gisenyi to Kibuye and further to Cuangugu is also famously photogenic if the public ferry doesn’t fit into your schedule. Have you been in Rwanda, or would you dare to sail through the explosive Lake Kivu with a public boat? 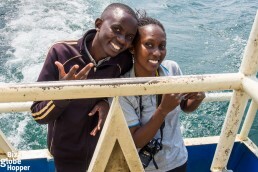 Disclaimer: We were touring Lake Kivu with Lobelia Tours and Travel Agency, but all opinions remain our own. Me met so many locals on the boat! Getting a harsh reality check in the Kigali Genocide Memorial in Rwanda, where death and cruelty looked us straight in the eyes. I love this pictures of the lake! 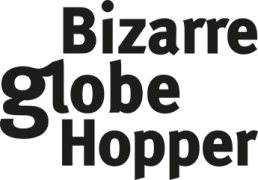 It sounds like a bit of a scary experience, but amazing nonetheless!